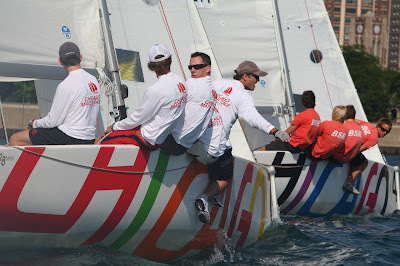 Waka Racing in a prestart at the Knickerbocker Cup. Supplied image. Today was the first day of the Knickerbocker Cup and it was good one for us! The breeze was in and the sun was shinning. The race committee was on fire completing 13 flights and so were we ending the day with 7 wins – 1 loss to be leading th regatta after day 1. 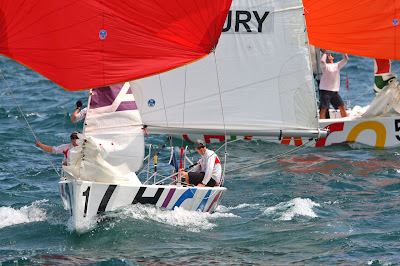 Our only loss came in our first race against Chicago Match Race Center legend Bill Hardesty. It was a close affair during the prestart and first beat with a number of close dips and lee bow tacks. Unfortunately for us in one of these close situtions we pushed the point too far when Bill did a nice job of trying to lock us and we coped a penalty. We agreed with the umpires intial deision but when they decided to give us a red flag (this means we have to do our penalty immediately) we were left very bemused. There was no way back from here and Bill did a nice job of closing out the race. However this did not get us down, with confidence high we launched a hot streak of winning 7 races in a row. These included victories over Henrique Haddad, Dave Perry (recent winner of the Detroit Cup), Taylor Canfield, Rueben Corbett, Nicolai Sehested, Sally Barkow, and Anna Tunnicliffe. The race of the day was probably against our Black Sheep Racing friends where we coped a marginal penalty in the prestart for apparently not completing our tack in the dial up. The race was not over here however. We did a nice job of just winning the start and a tight couple of legs of racing entailed with the BSR boys right on our tail. Three quarters of the way up the second to last leg we finally got a little jump on them but too their credit it was still not enough for us to complete our penalty turn. However we looked ahead and it looked like we would gain some really nice pressure first on the final run to the finish. So instead of slowing up and trying to trap the BSR boys into evening up the penalties we deicided to go “balls to the floor” and do our penalty turn right on the finish line. The decision was the right one with us just gaining enough distance to complete our penalty just in front of them and finish first. Overall today was the best day we have had in quite some time with a really good vibe onboard. Tomorrow we have 6 flights off and then our last 3 races to complete the first round robin.We are looking forward to continuing our form so that we can get some good momentum going into the next stages of this regatta. 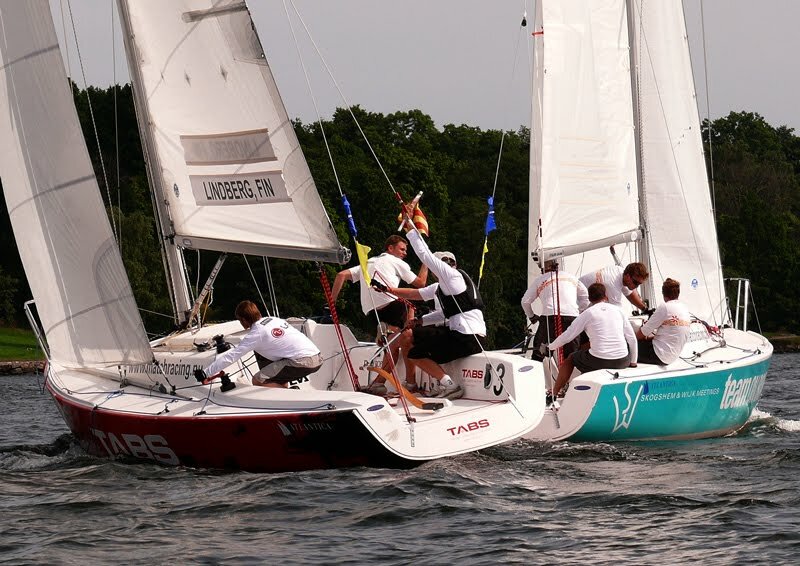 Racing started today at the Knickerbocker Cup, sailed out of Manhasset Bay Yacht Club in New York. A gusty 4 to 8 knot breeze held for all five of our races, making sailing to the pressure key with noticeable changes in speed occurring when in slightly different wind strengths. In our fourth race of the day against Russia’s Sergey Musikhin, we crossed the starting line with a penalty due to contact in a luff by Sergey late in the prestart. However we won the left side of the course and rounded the top mark with a three boat length lead. With good pace we further extended on the run and second beat, allowing us to complete our turn on starboard lay to the top mark and still hold a lead of three boat lengths. From here we were able to hold our lead to the finish. Finishing the day on three wins and two losses, we are looking forward to our remaining six races in the round robin. We have to finish in the top six in order to qualify for the next stage, so need to come out strong tomorrow. We didn’t get off to the best start at defending our Knickerbocker Cup title, finishing the day on 3 wins and 5 losses. True to form we have made it hard for ourselves going into day two. This now means we have to win our remaining three matches to have a chance at the top six. We had plenty of close races, with penalties going either way, but more often than not, couldn’t quite finish the job. We have the first six races off tomorrow so will have time to relax and have an easy morning, before finishing our remaining round robin matches tomorrow afternoon. The pressure will be on but we know we perform best under pressure so look to see us come out firing. This is a similar position to where we were last year after day one so we know we can come back from this. Racing can be seen live Scroll to the bottom of the page to see the live stream. Black Sheep would like to thank the Royal New Zealand Yacht Squadron, friends and family for their support. Thank you! Black Sheep Racing is Tom Bentham, Reuben Corbett, Brad Farrand and Andrew Clouston. Wibroe has a close encounter during racing in Finland. Image copyright Josefine Hackman. Peter Wibroe claimed the first place in the Baltic Match Tour 2010 after finishing first in Tallinn and second both in Stockholm and Helsinki. Neugodnikov's Synergy (RUS) team. Supplied image. Evgeny Neugodnikov, RUS, won the Maritim Baltic Match Race 3 in Helsinki, Finland. 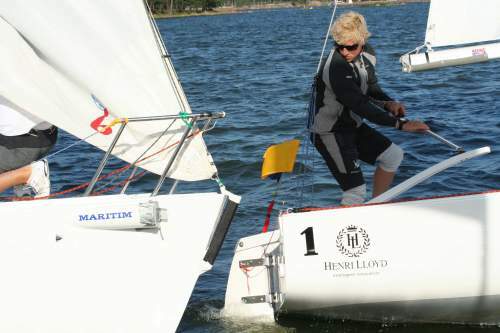 Neugodnikov won all his matches all through the regatta in Finland. 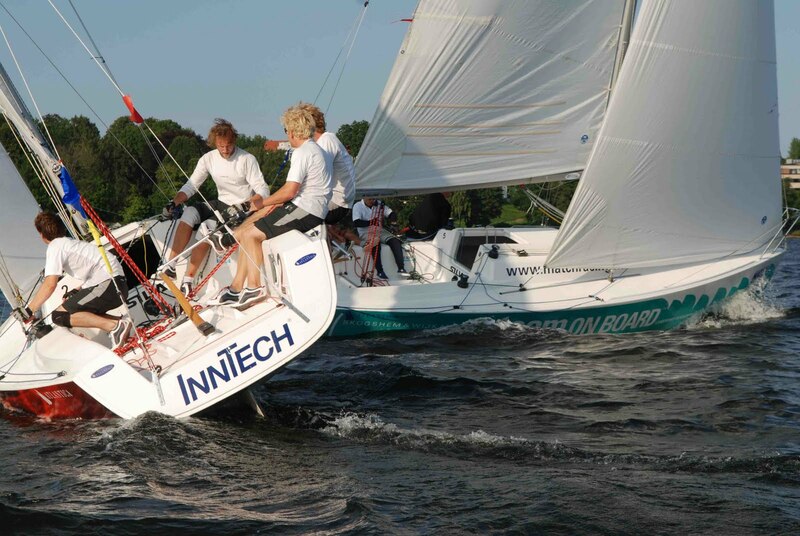 On the last day of the Baltic Match Tour, we raced in Helsinki. Unfortunately for us it was an unhappy end for us just missing out on the top 4 on count back. Going into our last 3 races we knew if won 2 out of 3 we would be safely through into the Semis. Race 1 didn’t start well against Evgeniy Neugodnikov. After doing really good work in the pre start to set up to win the favoured end of the line we were judged over the line early. This meant we had to return behind the line and enabled Evgeniy to just cross us and take the favoured right hand side. Unfortunately from there we weren’t able to claw back enough to have a shot at him. Race 2 was against Simone Ferrase who defeated us in the semi finals in Estonia. This time we took full revenge putting 3 penalties on him during the race and also coped one too. However we easily won this one. Race 3 the decider against Keith Swinton. We always suspected that this would be the race that decided whether us or Keith would make the semis and as things worked out it did. After a great start we lead throughout the race but with Keith snapping at our heals. We approached the top mark maintaing our Starboard advantage but right on the lay line, which meant we had to do a tack set (slow manoeuvre) at the top mark. We have done this type of set hundreds of time with no problem but in this situation we got a knot in the mainsheet as we were trying to turn around the mark and this stopped the turn. Once we recovered Keith was now right behind us in the favoured inside position. We decided to attack him while we still could, throwing a close gybe in front of him on to Starboard. We felt we had done this legally but the umpires once again had other ideas giving us a penalty. Once this happened we tried an aggressive luff to wipe the penalty off but the umpires ruled we did not give him enough time to keep clear giving us a second penalty. This effectively ended the race for us as we now had to take one of our penalties immediately. Keith went on to win the race and beat us on count back to make the Semi-Finals. So another heartbreaking loss for the boys but we had a good sit down afterwards and talked about the entire Baltic Tour. We came to the conclusion that this tour was a very tough event. It was 9 days in a row and had a Grade 1 calibre field and that is why it was so beneficial for us. We know deep down we’re not that far away from winning these regattas. We felt a few things hadn’t gone our way but that is how sport goes. Also the reason it had taken us a long time to adjust to these smaller boats (4 man boats) was that we have only match raced bigger 5 man boats this year. For us each crew members role onboard changes when the number of crew changes and we have struggled to adapt back to the smaller boats. However now we are feeling confident again and hopefully with our next regatta being the familiar Knickerbocker Cup in New York we can get a result that we have been trying so hard to strive for! Black Swan Racing in Finland. Image copyright Josefine Hackman. Following the completion of a hard fought round robin series, we progressed through to the semi-final stage of the Baltic Tour event in Helsinki. Going into the final race of the round robin we needed to beat Phil Robertson, Waka Racing in a winner take all race. Despite trailing for most of the race we kept it tight and managed to take the honours on the final leg. In the semi-final we raced Eugeniy Neugodnikov, Synergy Russian Sailing Team. The world number 8 was unbeaten in the round robin, he continued this form winning 3-0. We certainly had our chances in all races, wiping off a penalty turn in the first, to just be beaten on the line. Then leading the 3rd race but going to the wrong top mark, after being confused by the race committee signals. Following our loss in the semi-final we looked to bounce back against another worthy competitor in world number 7 Bjorn Hansen, Hansen Global Team. We really sailed to our ability in all three races, eventually taking out the petite final 2-1. "It was nice to make the semi-final stage after limited fortune in the first two Baltic events. By the end, we were sailing fast, starting well and making good decisions around the race track. We are happy to get this result." Keith Swinton Black Swan Racing. 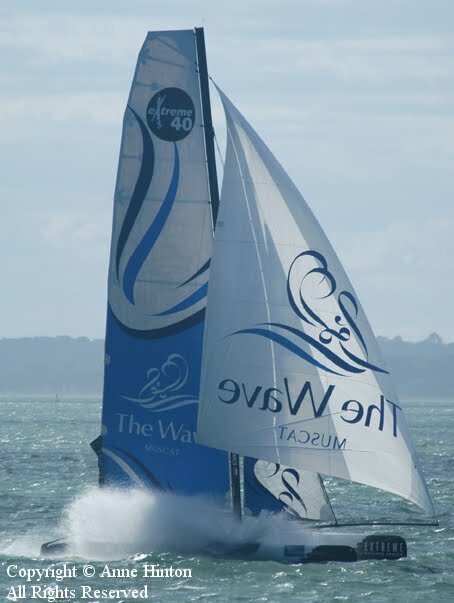 Black Swan Racing would like to thank our supporters: South of Perth Yacht Club, Kerman Contracting, Westrac Pty Ltd - the Equipment Management Company, Abbotts PTY LTD Chartered Accountants, McNally Group PTY LTD and Musto Australia & Sweden. 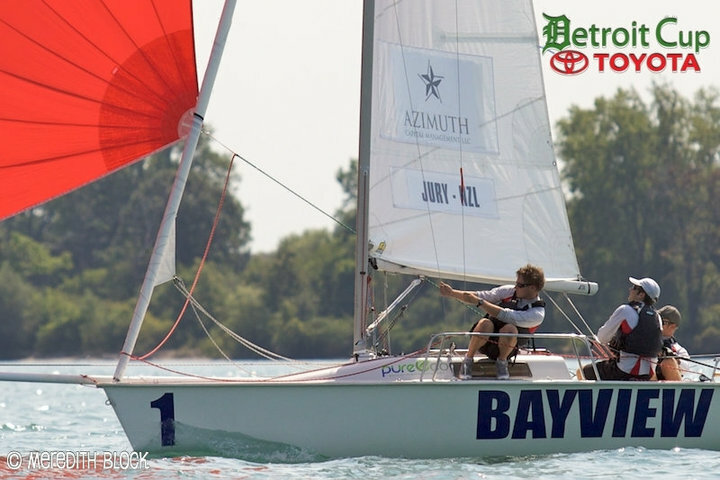 Dave Perry, three-time United States match race champion won the Toyota International Match Race for the Detroit Cup today, beating Anna Tunnicliffe (USA) three matches to one in the finals. Taylor Canfield, of the US Virgin Islands and Laurie Jury of New Zealand competed in the Petit Finals with Jury winning, two matches to none. The regatta, hosted by Bayview Yacht Club, featured twelve teams from five countries. Team Perry, led by Perry, also included Chris Museler on bow and Mike Rehe as trimmer. 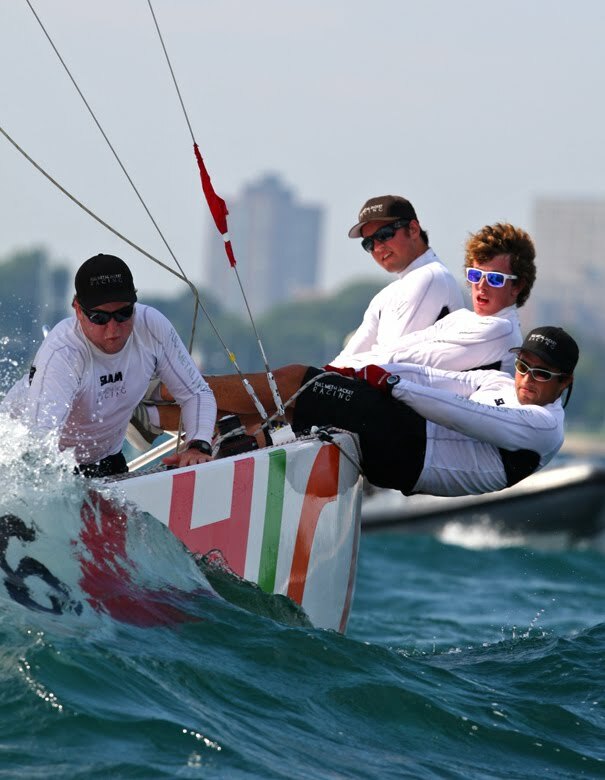 Rehe, a Bayview member, has crewed with two of the three Detroit Cup champion teams. 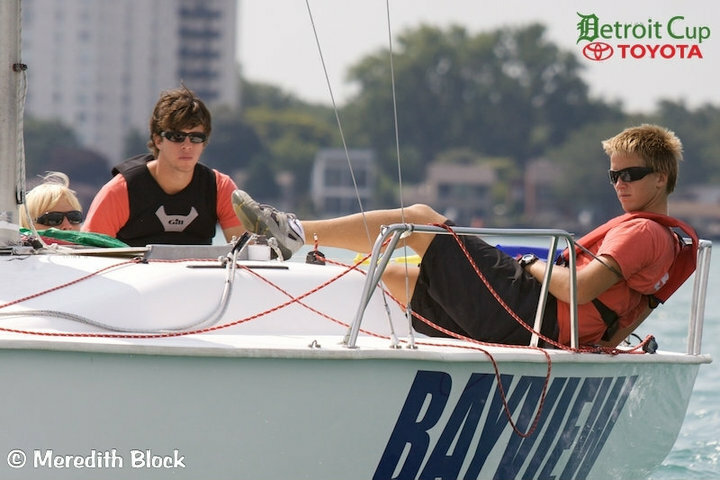 Both Perry and Tunnicliffe will compete on the water next week at the Knickerbocker Cup, the final stop of the East Coast Trifecta, which opened with the Chicago Match Cup before coming to Detroit this week. SLAM Kiwi Match at the Detroit Cup. Supplied image. This was our second year in Detroit so we came into the regatta with a bit of an idea of what to expect. The regatta format consisted of a single round robin, quarter finals, semi's and final's, but with 12 top class teams there wasn't a lot of room for mistakes. Added to that were conditions which tested the race committee's ability to get races away in some very tricky conditions. The first two days of racing were almost perfect but typically, the weather on Saturday proved so uncooperative that only the final three flights of the round robin were able to be raced and the quarter finals had to be cut from the programme. This left a number of teams with a bit of a problem, as now only the top 4 teams would qualify straight through to the semi finals. So any early losses in the round robin now became very costly and several teams were fighting to keep their hopes alive, including ourselves. Our problem though, was that we had already completed all our races and were relying on other results to go our way to ensure we could finish inside the top 4. Fortunately our Kiwi friends from Full Metal Jacket Racing were able to come from behind in their last race to beat local hero, Chris Van Tol. This result was perfect for us as it meant Chris was taken out of the equation and we progressed to 3rd on countback and into the semi finals. Dave Perry qualified first and had the choice of opponent for the semi finals. He picked Taylor Canfield from the US Virgin Islands leaving us to race Detroit Cup defending champion Anna Tunnicliffe. The finals produced some great matches with most races going right down to the wire. Anna and her team had definitely bought their 'A' game, showing that the time put into their Olympic campaign has been paying off. We had a big piece of them in the pre-starts and were leading in both races, but Anna and her team proved that time together and time on the water pays and they were able to get around us in both races to win the semi final. Dave was pushed to 3 races by Taylor but eventually came out on top pulling a few old tricks out of the bag. In a repeat of the Chicago Match Race petite final we had to race Taylor Canfield for 3rd and 4th. This time however we came out on the right side of the ledger easily beating him 2 – 0. Things weren't quite so one-sided in the final with Anna pushing Dave hard in all their races. Dave eventually came out on top however, confirming the master still has some lessons to teach his student. To finish third against this field was good and another consistent result, but still just lacking the final touch to finish it off. 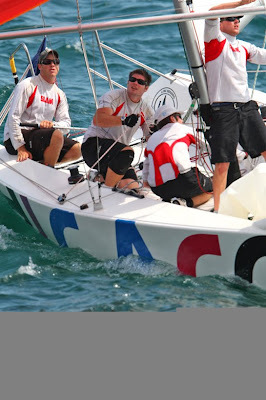 This regatta completes our USA leg for now as we were unable to secure entry into the next regatta. We have really enjoyed our time here again and are really impressed with the things that are happening with Match Racing in North America. The clubs are putting in a lot of effort to ensure the sport reaches it's full potential. We would especially like to thank our hosts in both Chicago and Detroit; their hospitality is hugely appreciated and makes the trip that much more enjoyable. 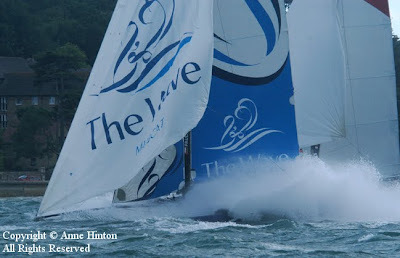 Thank you to SLAM and the RNZYS for supporting us and all our friends, family and supporters that follow our progress. Detroit greeted us with miserable conditions today, drizzly rain and very fickle winds. Having three races remaining in the round robin our aim for the day was to make it into the quarter finals. 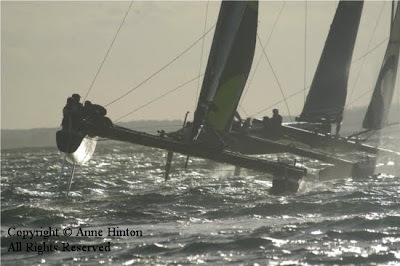 We sat out the morning on shore waiting for the wind to play game, allowing us to watch the All Blacks epic game. Racing got underway around 1 with us first up against Taylor Canfield, this didn’t turn out to much of a race. As we entered on starboard the breeze fully faded and shifted well right leaving us struggling against tide to enter. Down towards the pin he had more pressure and was able to enter and set up to leeward of us holding us out. 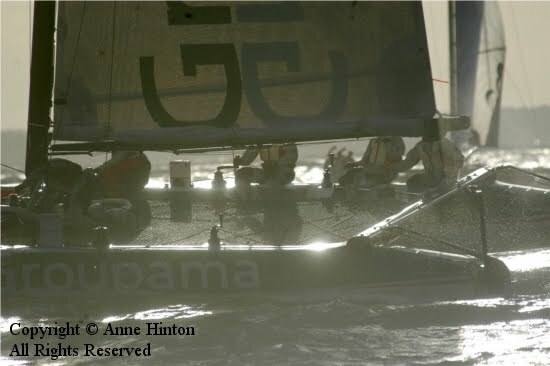 We managed to just roll over his bow to enter but then we were in a very tricky position and had to fight hard, as the gun went we were judged to be over the line costing us dearly as we had to push tide to get back. The rest of the race was a bit of follow the leader as with the right shift there were no tacks or gybes in the race. Normally a race like this would be called off but for some reason it was not. For our next two races the wind settled down and filled in allowing for some actual match racing. In our match against the Russian team we won the left hand side off the line with them tight to windward. On the first beat we stretched out a 2 boat length lead and held this down the run, we again added to our lead on the next upwind leg going into the final run with 8 boat length advantage. They chose to gybe set while we extended in what we believed nice pressure. It turned out we sailed into a big hole in the pressure while they picked up an awesome puff and sailed around us, in hindsight we should have covered. In our final race we were up against local sailor Chris Van Tol and top American ranked skipper. He held a slim advantage off the line but we kept it close and on the final run we sailed the pressures perfectly to get the lead and take the win. With time running out the RC decided to cut out the quarter finals and go straight into the semis, this spelt the end of the regatta for us. Our next regatta is the Knickerbocker Cup stating on Thursday and we are looking putting together a much better performance. Relaxing before the next race. Supplied image. Black Sheep won two from three today. The entire first flight was raced in very marginal conditions as half the competitors requested redress due to the course being lop sided. However, the race committee was determined to finish the round robin regardless, so all results stood. We didn’t request redress but we did lose the match despite leading until halfway down the final run. It was almost one of those races where you are too far ahead which increases the risk if a shift or significant change in pressure occurs. We lost our race to Chris Van Tol (USA) to then beat Sergey Muskhin (RUS) and Taylor Canfield (USVI). The organizing authority decided to cancel the quarter finals as they are worried about completing the format. Dave Perry 9 wins, Taylor Canfield 8 wins, Laurie Jury, Anna Tunnicliffe, Bill Hardesty and Black Sheep are all on 7 wins. Six doesn’t go into four so the semi final competitors had to be worked out using the count back system. This worked in favour of Laurie Jury and Anna Tunnicliffe. Top ranked Dave Perry had the right to choose his opponent, he chose Taylor Canfield. This leaves Laurie Jury and Anna Tunnicliffe to race in the other semi final. Weather conditions remain marginal so everything is on hold at the moment. Black Sheep finished in sixth place. It’s a tough way to be knocked out of a regatta but that’s the nature of the beast. The team is now getting ready for the last regatta of the USA Trifecta which is held at Manhasset Bay, New York. Black Sheep Racing is Tom Bentham, Reuben Corbett, Brad Farrand and Andrew Clouston (Coach). 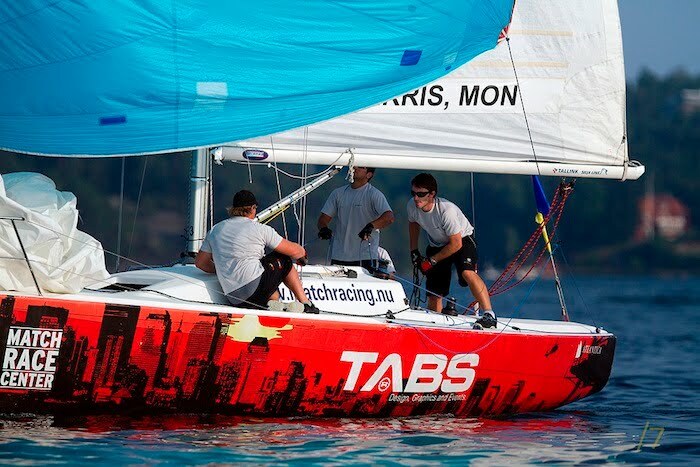 Waka Racing finish third in Estonia. Supplied image. After an hour long delay due to lack of wind we headed out to race in the lightest conditions yet, in Estonia. In our semi-finals we were up against the Italian Simone Ferrarese, who we were quite happy to race. Unfortunately for us the Italians were on fire in the light conditions and although we definately had our chances we failed to seal the deal. In all 3 races we were ahead at some stage but to his credit Simone and his team sailed really well to get ahead of us. With the semis been and gone we really wanted to make sure we finished the event on a positive note and finished 3rd. After another short delay the wind finally kicked in, changing the conditions from the morning considerably. We were racing Robert Nyberg and thumped him in both races to close out the series 2-0. Although 3rd is an improvement, we are now hoping we can continue the progression and take it another step in Helsinki. This afternoon we are catching a ferry to Helsinki, Finland with our final event in the Baltic Tour starting tomorrow. Baltic Match Tour - Estonia: Thunder, Lightning, Wind and Rain! Waka Racing in Estonia. Supplied image. Since we last left you we have done quite a lot. We have travelled by overnight ferry, arriving mid-morning in Tallinn, Estonia. Then not wasting much time to head straight out racing and not coming in untill 8pm last night. Racing for us has contined today in lightning, thunder, and torential rain truly testing our Zhik Wet Weather gear. Throughout both days racing has been conducted in shifty, mainly moderate to very windy conditions. To be honest this regatta didn’t start off any better than our previous one with two truly infuriating loses. The first being against Mike Perris, when as we entered the pre-start our port winch (that had been working fine for our whole warm up) decided to start spinning both ways. This meant Sam (who is trimming the jib for this event) was severely disadvantaged for the entire race. However we battled hard and put pressure on him throughout the race to lose by ¼ of a boat length. So there we were again staring down the barrel of another terrible and unlucky start to an event. This time however we turned it around. We finished the day with 3 wins/ 2 loses. The highlight being, convincingly beating top ranked Bjorn Hansen from start to finish in tricky conditions. We continued our form from the end of day 1 to sail well and gain 3 wins in our morning session. Then after a long 6 race off break, we were back on the water at 6pm to complete our remaining 3 races in the round robin. These were all close affairs with victories over Simone Ferrarese, Keith Swinton and a loss to Eugeny Neugodnikov. Once again it has been another late finish for us getting off the water at 8:30pm. However we came ashore to find out that we had finished the round robin 2nd, losing to Peter Wibroe (1st) on countback. Tomorrow we have the semi finals where Peter will pick between ourselves, Simone Ferrarese, and Robert Nyberg. We are not fussed who we race and are amped for some tough racing tomorrow! Peter Wibroe in competition in Sweden at the Baltic Match Tour. Image copyright Henrik Grape. - We are really pleased with our win today comments Staffan Lindberg. Especially since we lost in the finals last year against Wibroe. - We have felt we have had an edge with our boat speed throughout the event but we can work more on improving our starts. Fortunately we have managed to shift gear in each race even though some poor starts and managed to get on top of things. Competition in Sweden at the Baltic Match Tour. Image copyright Henrik Grape. - Despite us not winning today we are overall happy with our performance throughout the event. As a team we came here with not enough time in the boat but we came out ok since day one. In the last final race we got a penalty against us before the start which of course was not ideal. 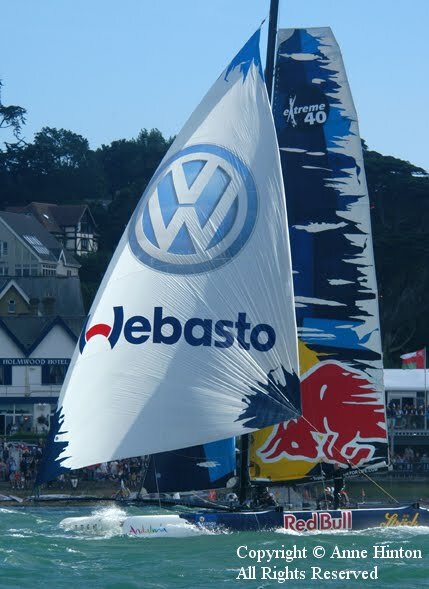 Nevertheless Lindberg managed to gain his lead on the last downwind and when we took the penalty he was in front of us. initiators to the Baltic Match Tour. - We are of course not pleased with not winning today but I am very pleased that the teams are having a good time and like the new match racing concept comments Björn Hansen. 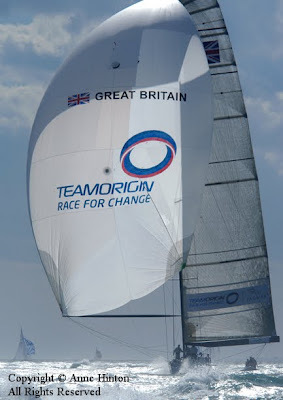 For next year we are hoping for stronger winds and we are looking forward going racing tomorrow in Tallinn. BlackMatchNZ on board with Michele Perris at the Baltic Match Tour. Image copyright Johan Granath. • Tallinn 16-18/8. 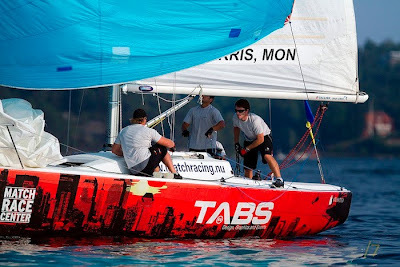 Organizer: Estonian Match Racing Union. Venue: Pirita. We completed five races of the round robin stage. We finished with a score of 4 wins 1 loss. "It was a tricky day today with light and shifty conditions. We were a little rusty with some of our maneuvers and starts but we really improved during the day. Our only loss, against Peter Wibroe was a little unfortunate because we did a real nice job wiping off a penalty but the umpires missed the contact between the boats after our luff which cost us. Our best win was against world number 8 Neugodnikov,of Russia werewe sailed away completed a penalty and won the race." Keith Swinton Black Swan Racing. Black Swan Racing would like to thank our supporters: South of Perth Yacht Club, Kerman Contracting, Westrac Pty Ltd - the Equipment Management Company, Abbotts PTY LTD Chartered Accountants, McNally Group PTY LTD, Musto Australia & Sweden. It has been a tough couple of days onboard our boat. We have now been knocked out of the tough formated, first event of the Baltic Match Tour, missing out on the semi-finals. The event started yesterday with an extremely frustrating day in light, very shifty conditions. Our first opponent was no slouch, top ranked skipper Bjorn Hansen (ISAF 7th) and this pretty much set the tone for us for the day. Our start was not good but we came back strong to be right behind and enforce a penalty on him on the final run to the finish. We were in a very strong position and as we were approaching the finish we had managed to gain mark room on the finish mark so the race was pretty much ours. 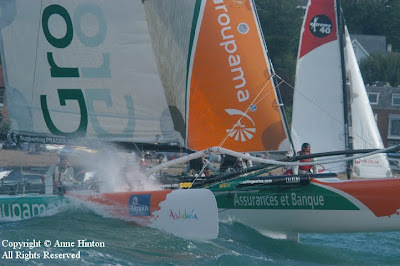 However, Bjorn never gave up and illegally forced us to the other side of the finish bouy so we couldn’t finish. The umpires penalised him for doing so, which meant he now had two penalties owing. By doing so he had pushed us into a really bad position and was able to complete one of his penalty turns and then line us up on starboard to wipe his remaining turn. In this situation normally Bjorn would have been penalised twice for pushing us outside the mark as it disadvantaged us so much and therefore would have been black flagged from the race. However in the heat of the moment the umpires were gun shy on getting out the black flag, handing the race to Bjorn. We were furious as we were completely robbed and on reflection the umpires apoligised for not disqualifying him from the race. After this we talked about not letting the race affect us and hoped it would not come back to haunt us. However the frustration continued not only with umpires but wind also. Next race against Mike Perris. He ran into the back of us in some close quarter action and the umpires completely missed the incident. 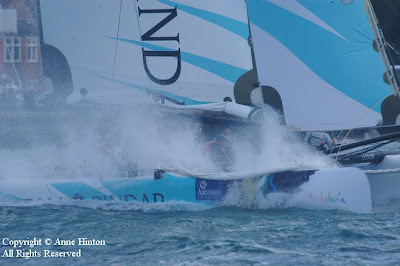 In two other races we were right behind or ahead with penalties on our opponent on the final run and wind that was not visible on the water hit our opponent but not us allowing them to extend enough to complete their penalty and finish in front of us. By the end of the day we were pretty much pulling our hair out as we were sailing really well for 85% of the race and then using the remaining 15% to give away all we had worked for. At the end the day we sat down and could honestly say we were the ones that should have won all 8 of our races but through our own fault and others had lead us to a 3/5 win-loss ratio. Coming into day two our previous days performance had pretty much certified that we had no chance of making the top 4 after the single round robin was completed. This meant that today we were racing for pride and to try and move forward from this rut in form that the team seems to be in. Full credit to the boys, as we came out firing for our final two races to demolish both Eugeny Neugodnikov and fierce rival/great mate Keith Swinton. Onboard today everything clicked for the first time in a long time and the confidence definitely jumped up a level. So luckily for us we have our next event starting on Monday in Tallin, where we are 100% focussed on redemption! CMRC Chicago Cup. Image copyright CMRC. 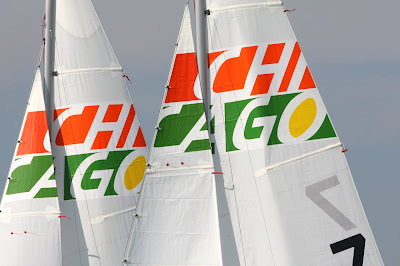 What a difference a day makes: near-perfect conditions produced a dark horse winner and the most exciting action yet in today’s final day of the 2010 Chicago Match Cup. Mike Buckley (USA) and his team of Nathan Hollerbach, Dave Hughes, Danielle Soriano, and Mark Pinney have claimed the top prize in this ISAF Grade 2 event, the first of the August Grade 2 Trifecta. Buckley has also earned an invitation to next month’s Danish Open, the next event on the ISAF Grade WC World Match Race Tour. Being the lowest-ranked team coming into the competition, Buckley’s win in an exciting 2-1 Final over runner-up Reuben Corbett (NZL) and his Black Sheep Racing team was made all the more remarkable for the fact that this was only the third match race regatta the Annapolis-based Buckley has sailed as skipper, the rest being as a trimmer or tactician. 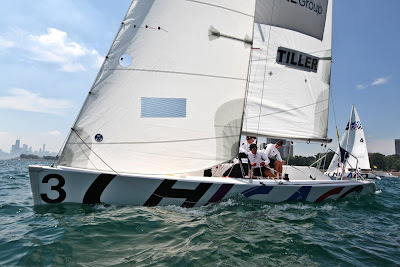 Will Tiller's Full Metal Jacket Racing (NZ) in Chicago. Image copyright CMRC. In front of a crowd of hundreds assembled along the Lakefront shoreline, the day started with many contradictions: reigning US Match Race Champion Bill Hardesty (USA) and his Team Line Honors was winner of the Round Robin on an 8-1 score yet fell in the first-to-two point Quarter Final round to Buckley 2-1 in an action-packed series with numerous lead changes and multiple penalty flags flown. But the team that had earned more flags than any in a single match, including a black flag, was the Tre-For Match Racing Team led by Nicolai Sehested (DEN). 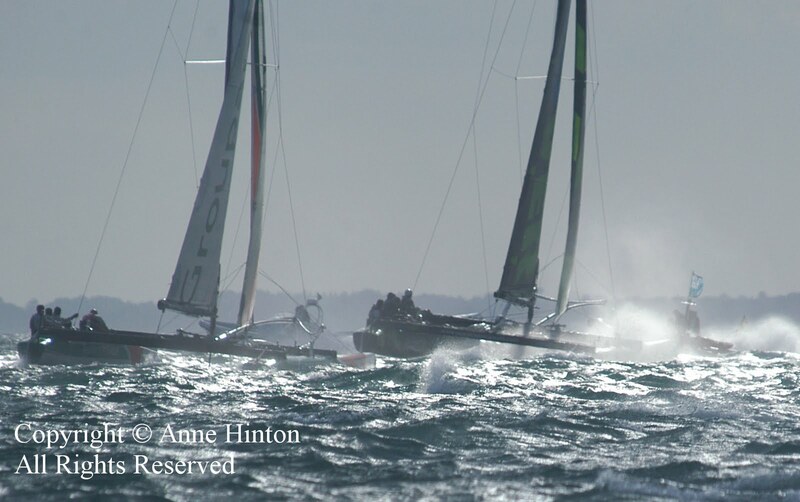 In their 3rd and final match with rival Laurie Jury (NZL) and his SLAM Kiwi Racing Team, the Danes first earned a penalty at the start, then another on a port-starboard encounter on the first beat. With the breeze filled in from the west, but varying wildly in direction and velocity, race managers gave the Semi-Finals a first-to-three point format, and it was the Jury versus Corbett “Battle of the Kiwis” that provided the most excitement of any rivalry in the event. Trading match wins all the way to the deciding fifth match, both teams hammered at each other all around the track, from entry to finish. 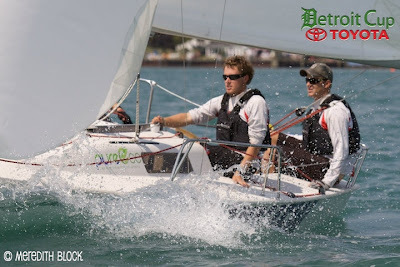 Corbett, along with fellow Kiwi William Tiller (NZL) and his Full Metal Jacket Team will be traveling later this week to the second event on the next event in the Trifecta, the Toyota International Match Race for the Detroit Cup, held at Bayview YC. Other invitees from this event going to Detroit are Sergei Musikhin (RUS), Taylor Canfield (ISV), Chris VanTol (USA), Hardesty, and Sehested. Most of these teams will also be going on to the third event of the Trifecta, the Knickerbocker Cup, held over 25-29 August at Manhasset Bay YC in Port Washington, NY, with the overall winner getting an invitation to the Long Beach YC’s Congressional Cup in March 2011. 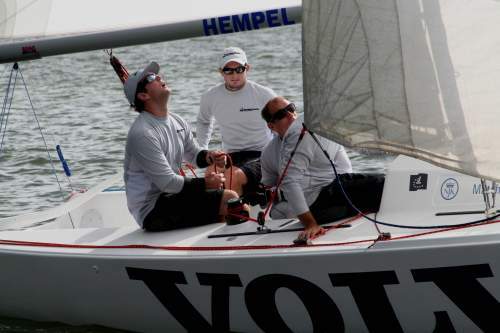 "This was a great competition, and we're very excited to see this level of match race sailing growing in the US," said Chief Umpire Steve Wrigley. "The quality of the competitors, race officials, and event managers has now truly reached world-class standards." Official Partners of the CMRC and the Chicago Match Cup include CME Group and the City Inns family of hotels, and NYSE LIFFE is CMRC’s official Boat Sponsor. For more information about the other two August Grade 2 Trifecta events, visit www.detroitcup.com and www.manhassetbayyc.org. SLAM Kiwi Match in Chicago. Image copyright CMRC. It was another case of close but not quite close enough for SLAM Kiwi Match in Chicago. It came down to the last couple of hours of racing on Sunday afternoon but unfortunately the shifts didn't quite go our way; and boy, they were some serious shifts! Things were looking a bit shaky on the Saturday afternoon for the Chicago Match Race Centre to complete a full programme of racing. After several futile attempts in a light fickle breeze to hold the second round robin it was decided to send everyone ashore and a new plan was developed for Sunday, weather permitting. Fortunately the weather mostly played along on Sunday and a wise decision to hold quarter finals instead of a full second round robin was made. This was a great decision for us as a slow start in the first round robin meant we would have struggled to make the top 4 without a full second round robin. We were paired with Nicolai Sehested in the first to 2 point quarter finals which we were comfortable with, having felt solid against him in our round robin race. Our confidence was proven justified winning our quarters with relative ease including a black flag win in our last race. This put us in the very familiar position of racing fellow Kiwi Reuben Corbett in the semi finals. 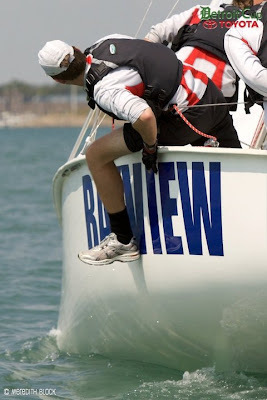 Reuben was also coming off a slow start in the regatta and only just scraped through into the top 8, however we knew never to underestimate the Black Sheep Racing team. The gentle northerly breeze held in nicely for the start of the semi finals and the racing was living up to everyone's expectations. With penalties, luffing, close crosses and closer mark roundings, things were swinging in our favour taking a 2 – 1 lead in the first to 3 point semi. This unfortunately, was the end of the breeze playing along and a complete shut down for over an hour put the regatta on hold once again. When the breeze did return it came from a new direction and changed the racing into a completely new game. Blowing directly through the Chicago city buildings we were having 60 degree shifts and 15knt puffs. It was literally a mine field for match racing with the top mark set barely metres from the breakwall. It became less about match racing and more about winning a lottery, but even so, the close racing between us and Reuben continued. It came right down to the wire but didn't go our way as we lost our next 2 races to come up short. This put us in a sudden death sail off against Taylor Canfield for 3rd and 4th which we also came out on the wrong side of. It was a bitter pill to swallow after feeling confident at the start of the day and another case of what might have been. We will continue to build as a team from here though as we hit the road to Detroit for our next regatta. It is always a pleasure sailing in Chicago; the setup here is first class and completely unique. If only the conditions were as ideal as the setup it would almost be perfect. Thanks to everyone who followed the racing both on our website and the great coverage on the CMRC website, your support is appreciated. Also a huge thank you to Peter and Suzannah who kindly hosted our team in Chicago, your hospitality was amazing. 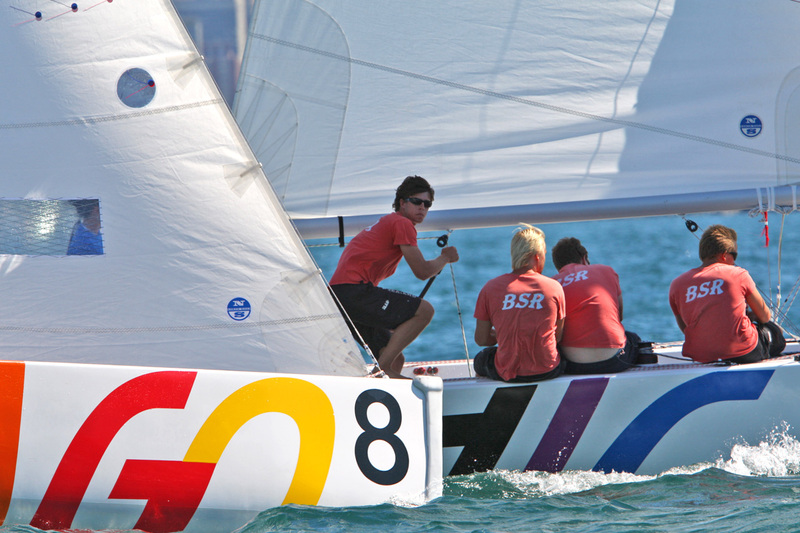 Reuben Corbett and Black Sheep Racing (NZ) versus Mike Buckley (USA) in the finals. Image copyright CMRC. 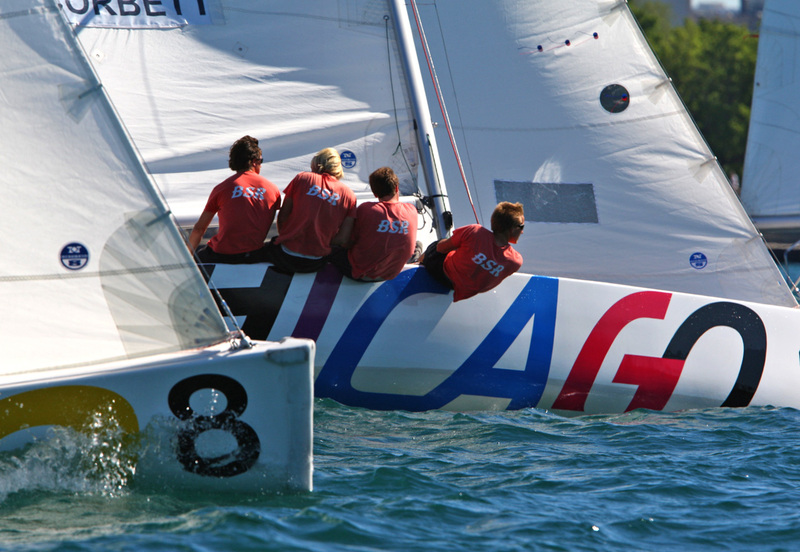 They do it differently here in Chicago as the top qualifier chooses their opponent and boat for the quarter finals. Surprisingly we were the last team to be chosen despite our results leading into the quarter finals. Don Wilson (USA) was nominated our competitor. Don beat us in the round robin but our team sailed well leading from start to finish in both quarter final races, winning 2-0. Black Sheep Racing at the CMRC Chicago Cup. Image copyright CMRC. 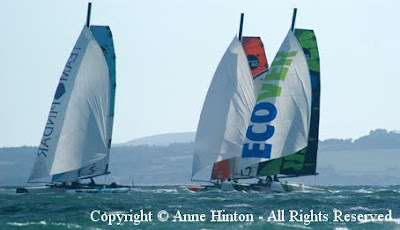 Laurie Jury (NZL), Taylor Canfield (USVI) and Mike Buckley (USA) were the other successful quarter final competitors. Taylor Canfield, being the top ranked chose to race Mike Buckley who again caused an upset to beat Taylor 3-0 in there semi final. 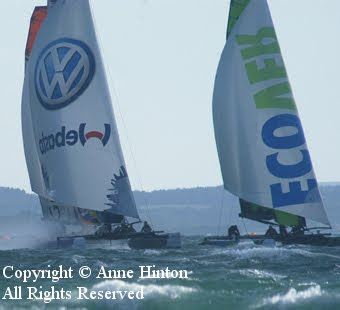 Laurie Jury and Black Sheep were once again paired together for a semi final, where all five races included penalties, lead changes and overall some thrilling match racing for the spectators. After being down 2-1 Black Sheep pulled through to win 3-2 thanks to some great team work. 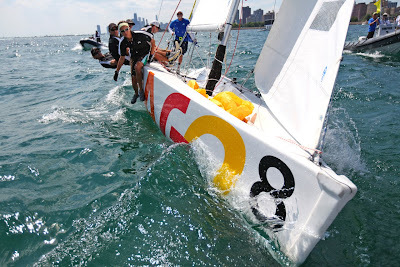 Black Sheep Racing during the Chicago Cup. Image copyright CMRC. Come finals time the wind started playing tricks shifting 90deg+ in either direction, predominantly offshore. That combined with an ever increasing sloppy sea state with a race track held a couple of lengths from the shore made for a fleet racing style final. Mike Buckley and his team who had been sailing the boats really well the entire regatta continued to do so and took out the final 2-1. Black Sheep are happy to have improved their placing from eighth at the beginning of the day to second at the end, however, it isn’t first. The team now heads for Detroit to compete in the Detroit Cup, grade 2 match race. The winners: Mike Buckley (USA). Image copyright CMRC. Black Sheep Racing would like to thank the Royal New Zealand Yacht Squadron, friends and family for their support. Thank you! Black Sheep Racing with the York Cup. Supplied image. Black Sheep have begun their North American tour starting with a road trip from New York to Toronto, Canada. 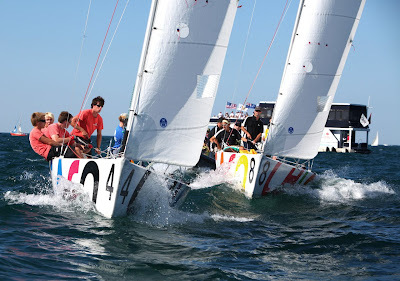 The team has a series of regattas including the York Cup, Chicago Match Cup, Detroit Cup and then back to New York for the Knickerbocker Cup. Black Sheep Racing proved the goods in Toronto, Canada where we won the York Cup. After a poor start to the regatta, the team gradually came together throughout the event to qualify for the semis in second place. We then won the semi final 2-0 before taking out the final 3-1 against Peter Wickwire. Black Sheep Racing on tour in North America. Supplied image. The aim of this event was to hone the teams skills prior to the Chicago Match Cup held August 13th-15th as Andrew Clouston has joined the team for the next set of regattas. With Andrew doing his maiden regatta on the bow and Tom doing main for the first time in a long while we were all a little out of our comfort zone but it came together in the end. We also continue our rise up the rankings, the latest of which includes our second placing at the Manu Minard Trophy in France. We moved up seven places to 18th. 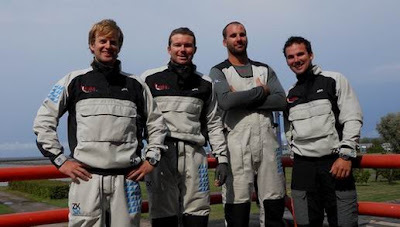 Black Sheep Racing is Tom Bentham, Andrew Clouston, Brad Farrand and Reuben Corbett. Sidney Gavignet crosses the finishing line off the Lizard, Cornwall, England. 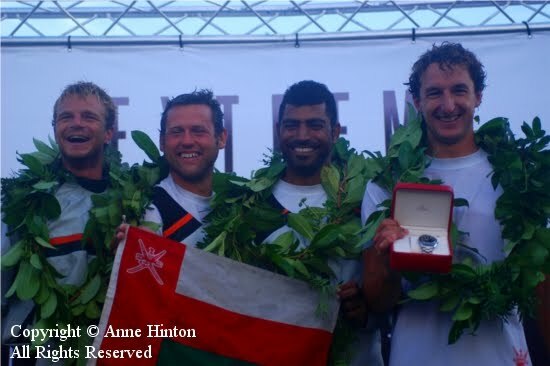 Image copyright Mark Lloyd/Lloyd Images/Oman Sail. 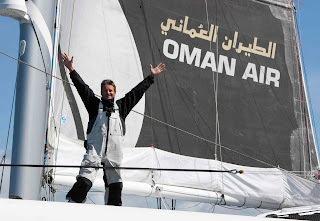 At 09:03:55 GMT Tuesday (24/08/10) skipper Sidney Gavignet (FRA) onboard OMAN AIR MAJAN crossed the finish line off Lizard Point, Cornwall to smash the single handed Round Britain and Ireland record. The A100 trimaran broke the existing record held by Thomas Coville by a massive 1 day 15 hours 30 minutes and 44 seconds. This incredible achievement also means Sidney has beaten the existing fully crewed record time by 1 hour and 7 seconds. This record was set by Steve Fosset onboard Playstation in 2002. 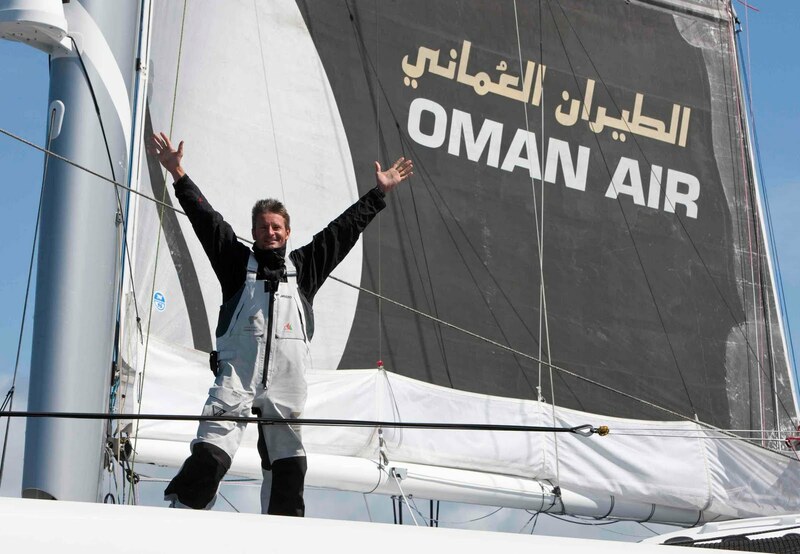 The record attempt has seen OMAN AIR MAJAN sail 1,787 miles along one of the most challenging coastlines in the world. Sidney has tackled huge low pressure systems and sailed through squalls of over 40 knots. 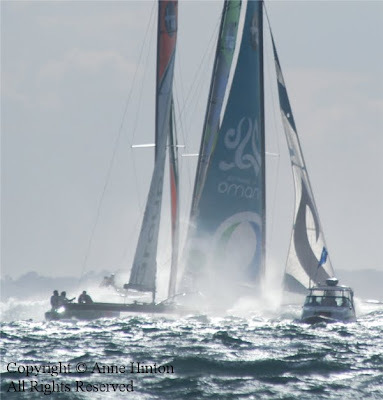 This is the first major test for OMAN AIR MAJAN and Sidney ahead of the single handed Route du Rhum race this coming November. The Wave, Muscat. Image copyright Anne Hinton - all rights reserved. 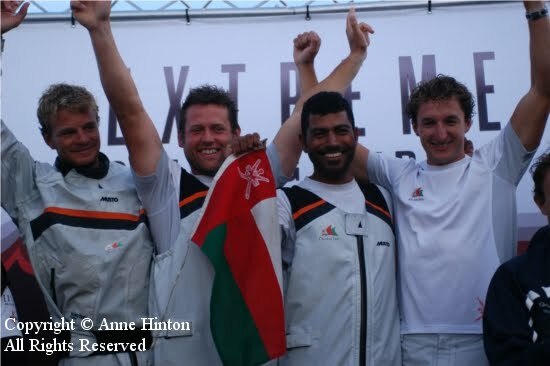 Crew of The Wave, Muscat. Image copyright Anne Hinton - all rights reserved. The Wave digs in. Image copyright Anne Hinton - all rights reserved. 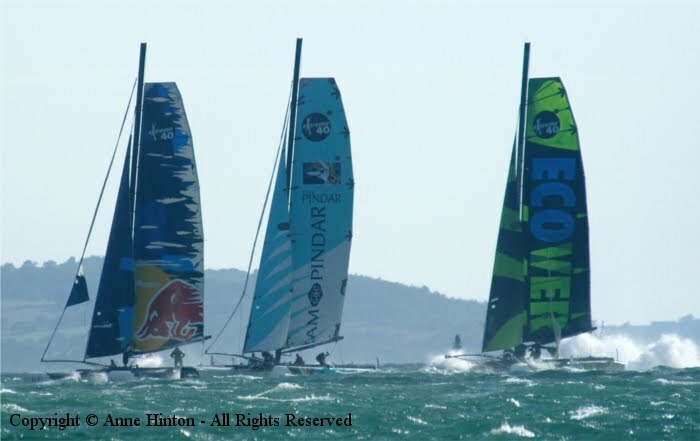 Red Bull, Team GAC Pindar and ECOVER downwind on the final day. Image copyright Anne Hinton - all rights reserved. 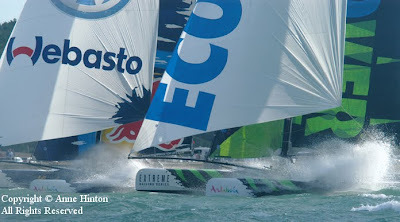 Team GAC Pindar, Groupama and ECOVER downwind on the final day. Image copyright Anne Hinton - all rights reserved. 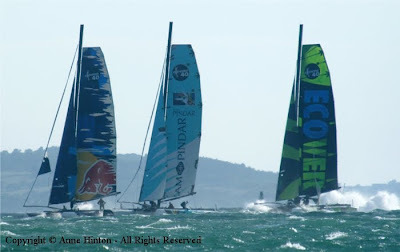 Red Bull, Groupama and ECOVER downwind. Image copyright Anne Hinton - all rights reserved. Red Bull and ECOVER. Image copyright Anne Hinton - all rights reserved. Red Bull. Image copyright Anne Hinton - all rights reserved. Team GAC Pindar and Oman Sail's Masirah at the start. Image copyright Anne Hinton - all rights reserved. 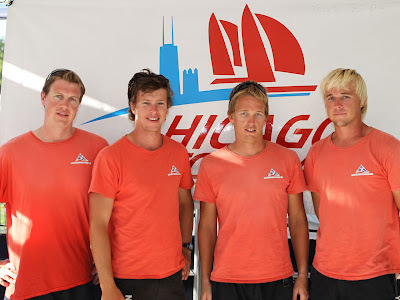 Team GAC Pindar. Image copyright Anne Hinton - all rights reserved. 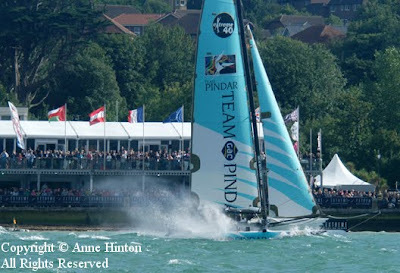 Team GAC Pindar passes the grandstand. Image copyright Anne Hinton - all rights reserved. 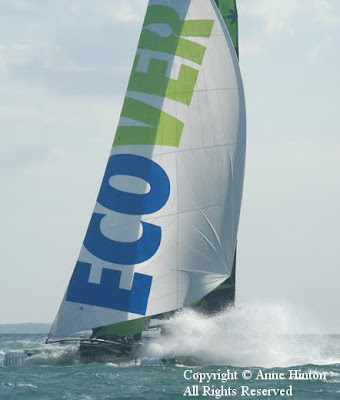 Oman Sail's Masirah, ECOVER and Groupama against the light with spray. Image copyright Anne Hinton - all rights reserved. 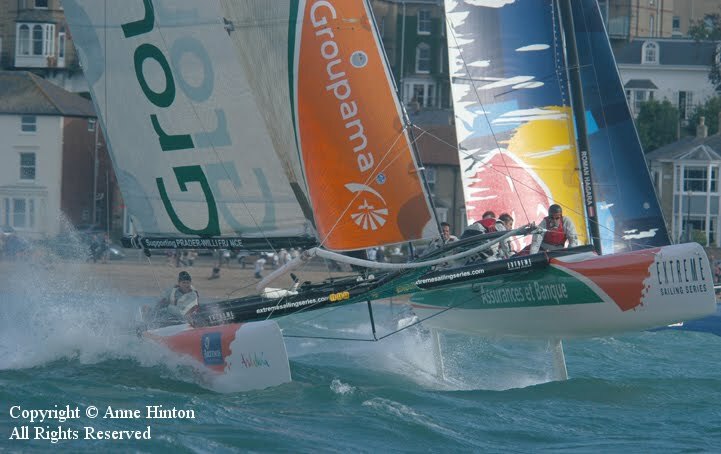 Groupama a. Image copyright Anne Hinton - all rights reserved. 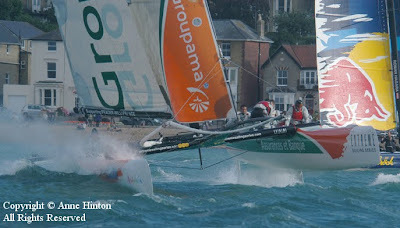 Groupama b. Image copyright Anne Hinton - all rights reserved. 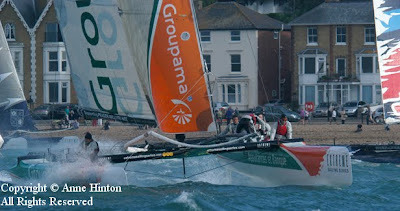 Groupama c. Image copyright Anne Hinton - all rights reserved. 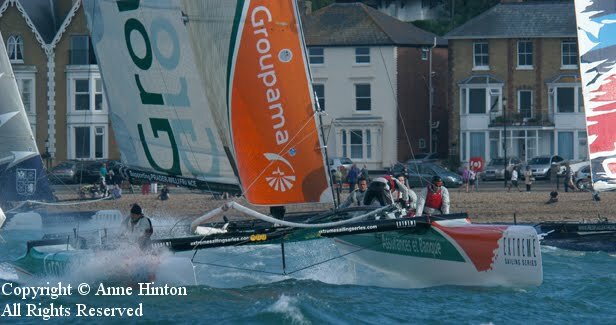 Groupama d. Image copyright Anne Hinton - all rights reserved. ECOVER. Image copyright Anne Hinton - all rights reserved. ECOVER crew in action. Image copyright Anne Hinton - all rights reserved. Red Bull, ECOVER and Oman Sail's Masirah. Image copyright Anne Hinton - all rights reserved. 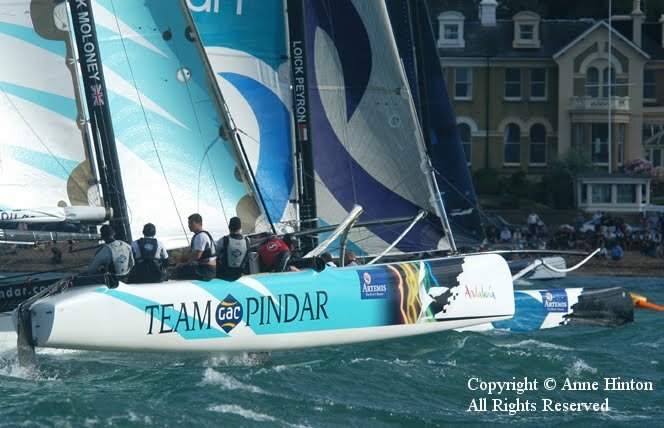 Team GAC Pindar against the light. Image copyright Anne Hinton - all rights reserved. 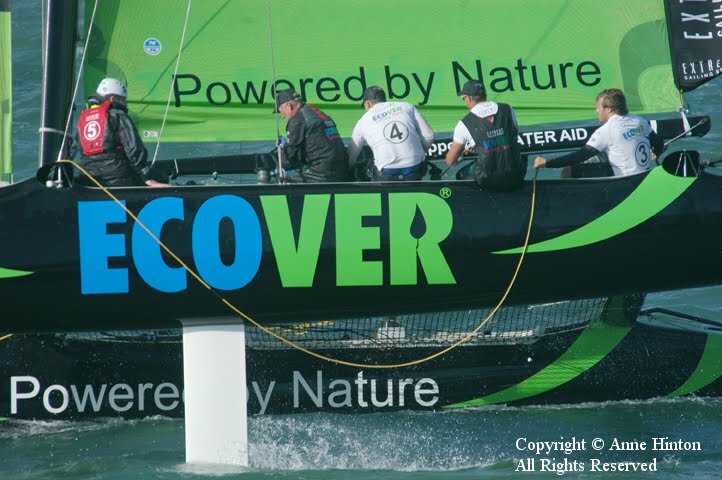 ECOVER and Groupama upwind into the light. Image copyright Anne Hinton - all rights reserved. 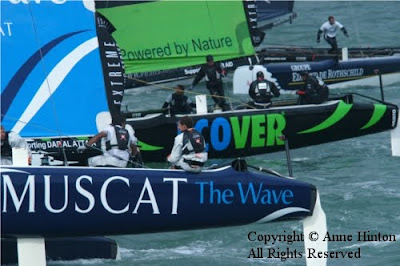 Two Extreme 40s upwind against the light: The Wave, Muscat, and ECOVER. Image copyright Anne Hinton - all rights reserved. Groupama against the light. Image copyright Anne Hinton - all rights reserved. 1-2-3 in Cowes: The Wave, Muscat; ECOVER; Gitana. Image copyright Anne Hinton - all rights reserved. The winners in Cowes. Image copyright Anne Hinton - all rights reserved. 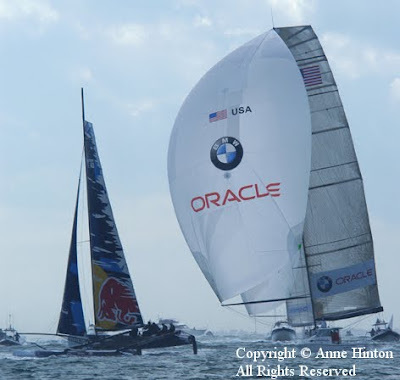 Red Bull and BMW ORACLE Racing. Image copyright Anne Hinton - all rights reserved. TEAMORIGIN racing with Jaguar. Image copyright Anne Hinton - all rights reserved.